It’s not uncommon to find many companies who offer delivery these days. After all, it seems like everyone is using a service like GrubHub or UberEats to make deliveries to local customers. However, knowing whether or not these meal delivery services are quality is a different story. We’ve heard stories from friends and family about how some of these services charge a larger delivery fee and often take much longer to get your food to you. Why not go with a meal delivery service that’s been exceeding in the arena for over 30 years? You can bet that we’d rather go with an expert than a startup. 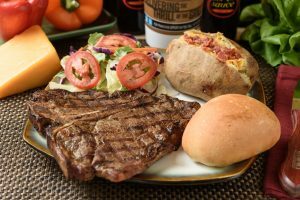 After all, an expert knows the tried and tested ways to provide a superior meal delivery service, and Steak-Out Charbroiled Delivery is the leading expert in steak delivery. Our crews provide not only perfectly-seared steaks, grilled over an open flame to the desired temperature, but also expert delivery, using items that keep every dish hot and ready for when it arrives on your doorstep. Let’s face it, there are those nights where you just don’t feel like cooking dinner for you and your family, and there’s absolutely nothing wrong with that. Sometimes it’s easier to let someone else do the cooking and the driving for you. Where do you turn when you want a delicious meal delivered to your home? Well, you could turn to your favorite local fast food joint and order through one of the latest deliver services: Chick-fil-A and McDonald’s are all hooked up on UberEats, and chain steakhouses, such as Longhorn use GrubHub to get their meals out on a delivery route. However, we’ve been delivering delicious steaks, seafood, chicken breasts, crisp salads and desserts for over 30 years, and we’ve used the knowledge we’ve gained over those years to perfect our deliveries. For example, we use special packaging to keep all of our food hot for when it arrives at your door. Our lunch specials (great for those busy work days) and entrees come with a pipin’ hot baked potato that works with the packaging to keep everything hot, plus all toppings and condiments come in a separate container keeping everything fresh so you can assemble it the way you like! When it’s time to choose the best meal delivery service for you and your family, go with the pros! Steak-Out Charbroiled Delivery has provided superior meal delivery service throughout the Southeast and Midwest for over 30 years, and we’re looking forward to another 30 years. Our menu options provide meals for every taste, including meat-lovers, vegetarians and those with special dietary restrictions. Our team knows how to ensure a delicious, fire-grilled meal when you want it. Visit our online ordering system to choose your meal, and we’ll get it to you when you’re ready. Let us prove to you why we’re the superior meal delivery service. After all, we’ve got years of experience on these new startups. Go with the experts for expert meal delivery service when you want it.